5 Bedroom Detached House For Sale in Sheffield for Guide Price £300,000. An immaculately presented five bedroom detached family home occupying an elevated position on this popular road within the sought after residential development of Owlthorpe. Benefitting from well-proportioned accommodation over all three floors and must be viewed internally to be fully appreciated. With a replaced modern contemporary family bathroom and en suite shower rooms, an attractive high gloss fitted dining kitchen with integrated appliances, dining room and dual aspect lounge leading out onto a rear enclosed landscaped garden. A blocked paved driveway provides off road parking for three vehicles and leads to an integral double garage with electric up and over door. 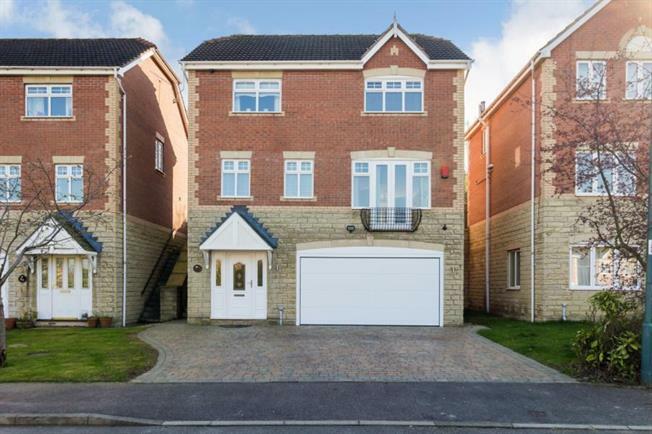 Ideally suited for the growing family wishing to upsize and be conveniently located for the Supertram network, local amenities, schools and access to the M1 motorway network link and Sheffield city centre. The accommodation in brief comprises: reception hallway with stairs to first floor landing, storage cupboard, shoe cupboard, courtesy door to integral garage, ground floor bedroom five (currently used as a gym) and ground floor attractive shower room with wash hand basin, low flush wc and double shower enclosure with mains shower within, tiling to walls, floor, spotlighting and ladder radiator. First floor landing, front facing dining room, dual aspect lounge with front facing full length window and French style door accessing the rear garden and rear facing dining kitchen having a range of white high gloss wall and base units with integrated appliances to include gas hob, electric oven, extractor fan, dishwasher, along with space and plumbing for a fridge/freezer and automatic washing machine. Stairs rise to the second floor landing where the master bedroom has a range of built in wardrobes and a contemporary en suite shower room with wash hand basin, low flush wc and double shower enclosure with mains shower within, tiling to walls, floor, spotlighting and ladder radiator. Further double bedroom two, bedrooms three and four and attractive family bathroom with three piece suite in white comprising wash hand basin in vanity unit, low flush wc and Jacuzzi bath, tiling to wall and floor, along with ladder towel radiator. Externally: the front driveway provides ample off road parking along with an integral double garage housing gas heating boiler with electic double door, power and lighting and courtesy door to the hallway. Steps rise to side gated access where there is an enclosed landscaped garden having artificial grass and decked sun terrace. Location: Owlthorpe is a popular area known for its excellent local amenities in the form of shops, schools and Sheffield Supertram networks. Ideally placed for links to both the M1 Motorway networks and Sheffield City Centre. Rother Valley Country Park nearby offers excellent leisure pursuits and Crystal Peaks Shopping Centre and Drakehouse Retail Park further superb facilities. The area is a short drive from surrounding local Derbyshire countryside and there are superb local restaurants and Gastro style public houses in the surrounding villages.